Good artisan bread takes time. No one can argue with this. The truth lies in the pudding pre-ferment. Artisan bread often calls for a starter/sponge/poolish/biga. All are pre-fermented doughs. They differ in formula, calling for various ratios of water, yeast and flour. Pre-ferments often take 6 to 18 hours to rise, depending on the warmth of your kitchen, the potency in your yeast, etc. So if one day you wake up hankering for a fresh baguette you’ll have to remember you might have to wait to have it the next day. Skipping out on the pre-ferment will short change you flavor and just damn good quality. And why would anyone want to skip out on that? Pre-ferments provide a stronger gluten, developed flavor, allows for the bread to keep longer without preservatives and the lactic acid bacteria produced can help neutralize some of the gliadin that causes wheat and celiac allergies*. Phew. That’s a mouth full. When you’re ready to make your dough you’ll have to remember that a lot of kneading and rising will have to be done. So more waiting. More patience. Great, tasty breads come to those who wait. During my bread course in Italy I soon learned there were two type of people: the ones who go after what they want and those too timid to give change a go. How did I come to this conclusion? Just by looking at my fellow bakers. I was afraid of the dough. I was too timid with it, fearful I was going to over-knead it. My fellow baker Maria slammed the hell out of her dough, showing it she was the boss, manipulating it, strengthening the gluten with strong, thoughtful kneading. Sometimes she would slap it against the table (it’s actually a kneading technique. Amazing stress buster). I was so envious. She was fearless and her breads came out amazing. Mine? 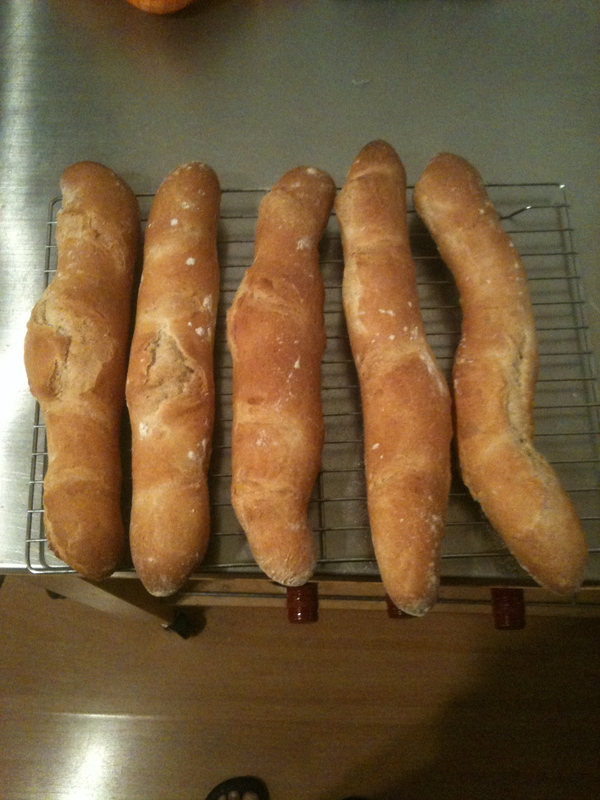 Well, the breads lacked great shape, sometimes, in the case of my ciabatta, it lacked good crumb. When I got home I learned to be fearless as well. Not surprising Maria teaches bread baking courses in London and she advised me that it is very very hard to over knead bread by hand. With that in mind I too started to slap and really knead dough, stopped second guessing myself and let the strength of the dough guide me. I confidently used the window pane method to make sure the gluten was strong. And guess what? My breads have been so much better. Sometimes you have to just let go, trust in your skills, stop being afraid and second guessing your choices. Letting go can be very liberating and freeing. Life isn’t always perfect and neither will be your bread. I may not be good at slashing or all that great at shaping but it’s all good if the bread tastes great and warms my belly.I often feel disappointed in my misshapen loaves, that is, until I take a bite. Besides, imperfections give character. I abandon my Kitchen Aid for most of my bread making these days. Because the ciabatta/focaccia dough is so wet I use Foxy Brown (yes, she has a name) initially and then finish it off by hand. Because you can run the risk of overworking the dough I have stayed clear of using the mixer. And besides, kneading dough is so relaxing and rewarding. I was always afraid to do it. No more. Another gadget, or rather, tool that I don’t use is a baker’s stone. And not because it doesn’t improve quality, because it does. My goodness! 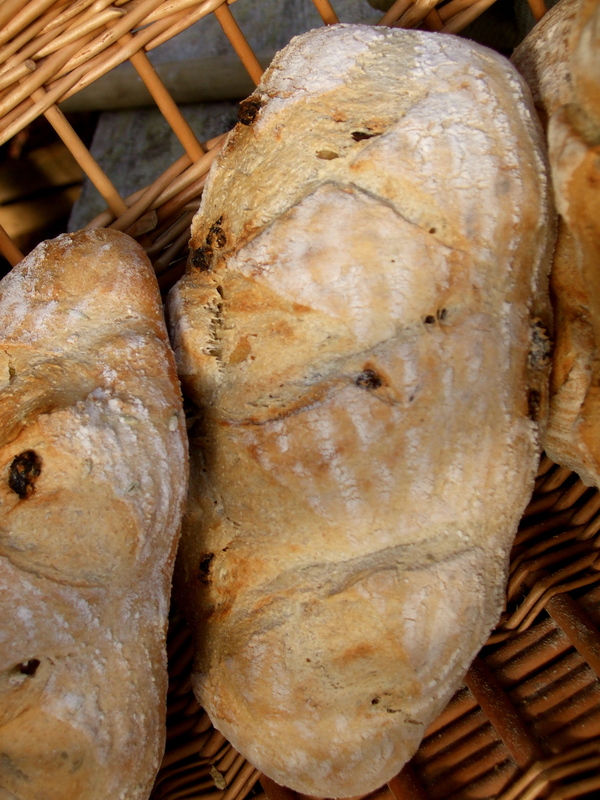 Stones retain heat better which helps bake the breads evenly and produce a crispier crust. 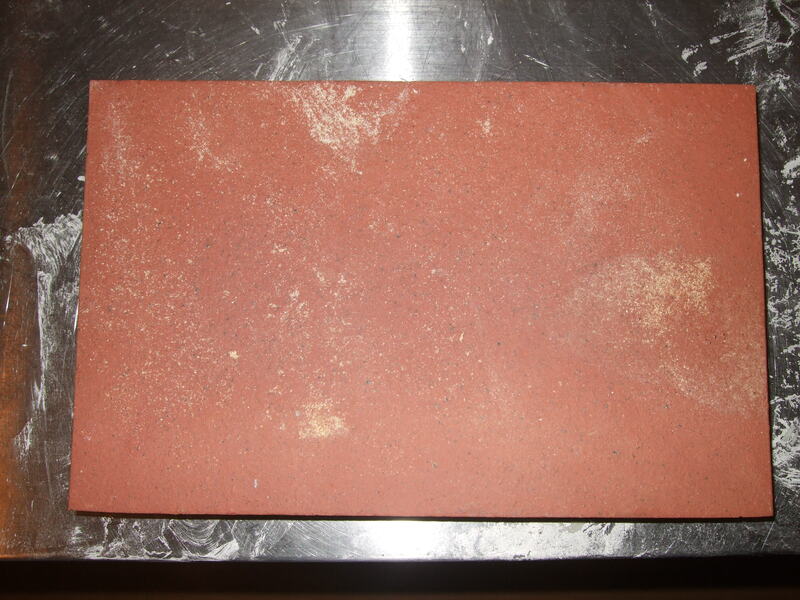 I don’t use one because I found a cheaper alternative: unglazed terra cotta tiles. I own baking tiles but I left then in the States, afraid they wouldn’t travel well. At my baking course I learned that terra cotta is a great alternative at a fraction of the cost! I got six tiles (four for my oven and two extras) for £4. Compare that to £40 baking stone and there’s no question which one I chose. 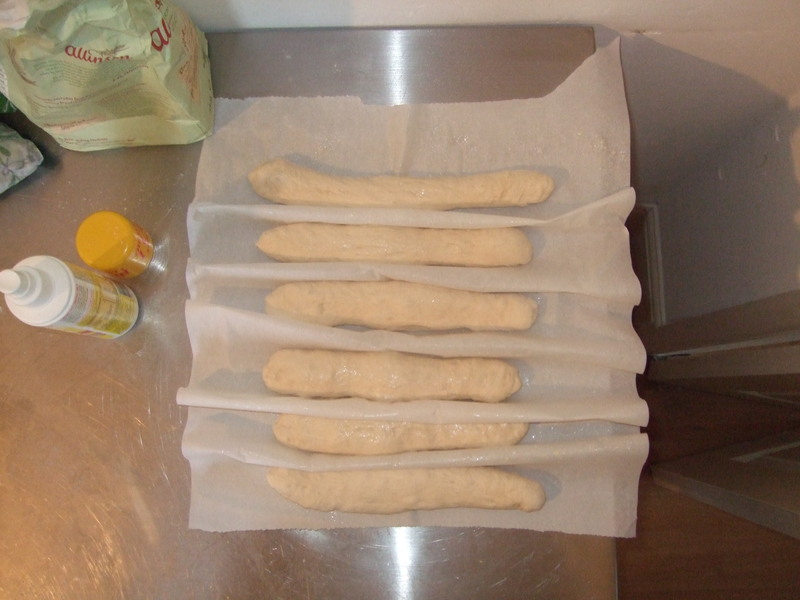 When proofing baguettes you use a couche. It prevents them from spreading. Mine got lost in the move. With a batch of dough ready to shape I improvised using parchment paper and oil spray. Unfortunately it’s not reusable but works if you find yourself in a pinch. So those are just some of the lessons I have learned baking bread. Hope you enjoyed reading because I really enjoyed sharing my bread experiences. 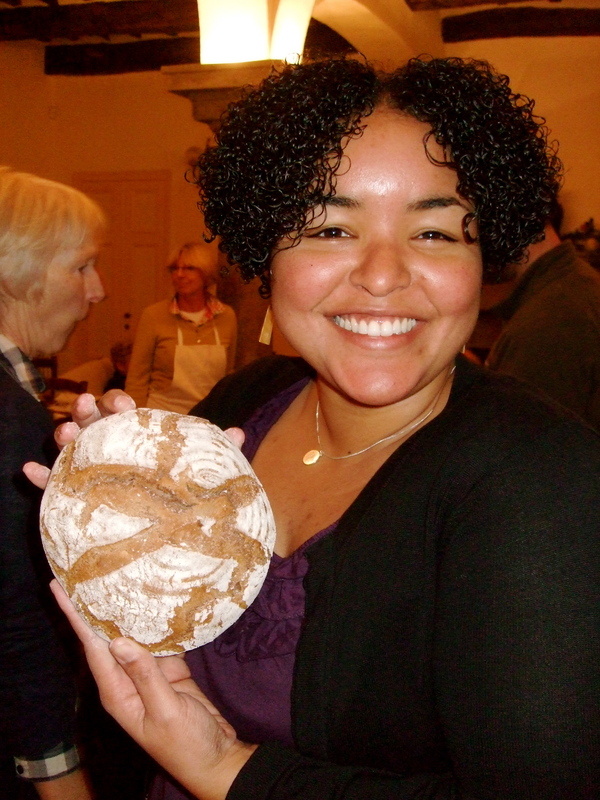 * Whiteley: Bread Matter: The State of Modern Bread and a Definitive Guide to Baking Your Own. Fourth Estate, 2006: p 38-41. 26 Jan	This entry was published on 26/01/2011 at 2:55 PM. It’s filed under baking, bread and tagged baking, bread, hobby, kneading, photos. Bookmark the permalink. Follow any comments here with the RSS feed for this post. Just saw your comment on Texpats! I will totally keep you posted on my food adventures — I *will* find good food in London. I’m so excited to know there are other texpats (and austinpats at that!) in London – who of course love to eat!!! We have been so unlucky in choosing places to eat here. We need guides! But yes, we definitely love good food and can’t wait to see what you find. Thank you! You should give it another go. I’ve made quite a few bricks in my time.